As the clock struck 6 p.m. on the chilly evening, a wave of warmth seemed to emanate from the Yajur Mandir as Swami emerged and headed towards the Poorna Chandra auditorium where all the alumni had gathered for a session with their beloved Swami. 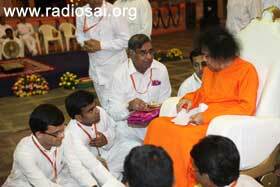 Swami moved in from the stage door of the auditorium and He was welcomed with Veda chanting and the Poorna Kumbham on the stage. 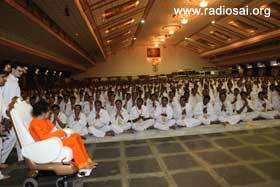 Swami moved down the stage and just the sight of so many of His students seemed to make Him happy. He called two students who were holding letters and accepted them. 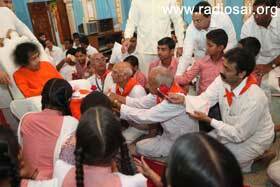 Then, He gave each of them a Vibhuti packet, which they treasured as they put in their pockets. 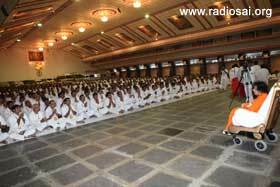 Swami moved to the small temporary stage that had been put up and sat as the songs recorded by the students were played. 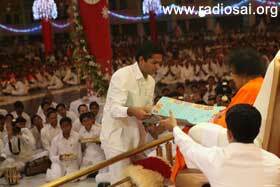 Swami blessed a few cards and accepted flowers before the two speakers came forward and sought His blessings. The first was Dr. Mayur Pandya. Speaking in English he narrated two anecdotes, carrying everyone down the memory lane. For those who came in late, his speech was also a peep into the beautiful physical proximity that the early batches of students enjoyed with Swami. 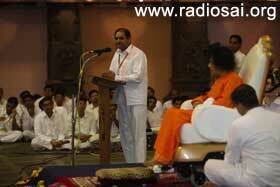 The next speaker was Mr. Kota Siva kumar and he spoke in Telugu. One anecdote that he narrated had such an inspiring lesson on the importance of good company. On one occasion on the way to Kodai Kanal, Swami relinquished His car to give joy to His students in the bus. 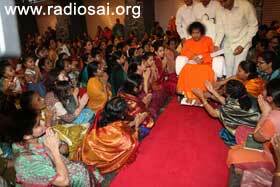 As the car went ahead, devotees rushed to pay obeisance to Swami, who they thought was in the car. Disappointed however, they turned back and left. Swami then said in His inimitable style, “See, that car receives salutations for it keeps My company. And here, since I keep your company, nobody is even looking at Me!” There was laughter all around but that was pure wisdom - happiness is union with God. 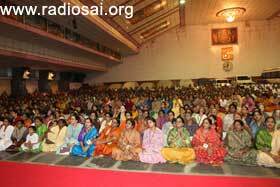 The parents, spouses and relatives of all these students were seated at the back of the hall separately. 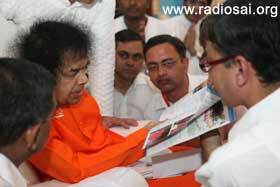 Swami took a quick round blessing them too. 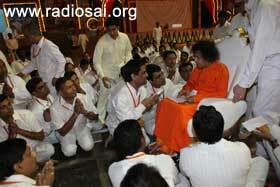 Swami then moved to the front through the central path between the students. Coming to the front, He blessed apples for distribution and satisfied the yearning of so many students to touch His lotus feet. 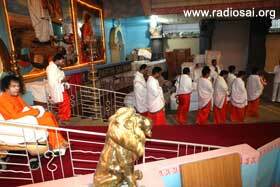 Ascending the stage, Swami moved out of the auditorium and into the car. He entered Sai Kulwant Hall and taking a detour after the ladies’ side, moved towards the portico. 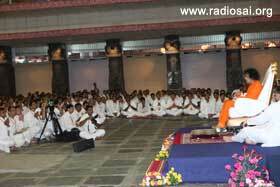 Swami arrived on the stage and seemed so happy and satisfied! He received aarthi after a couple of bhajans and then moved into the interview room. 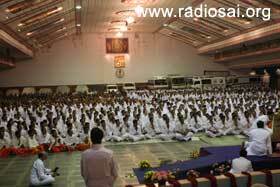 From there, He went into the Bhajan Hall where a special group from Team Sri Sathya Sai Vidya Vahini along with a set of school children was awaiting His arrival. 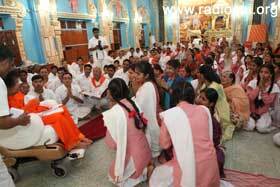 The group appraised Bhagawan of the various developments of the project. A group of selected school children from Sri Sathya Sai Jagrathi Vidya Mandir, Darwa, Yamuna Nagar, Haryana, where Vidya Vahini project is being implemented also was present along with teachers partaking the blessings. The school is being run by one of the alumnus of SSSIHL as depicted in the drama staged on December 31. 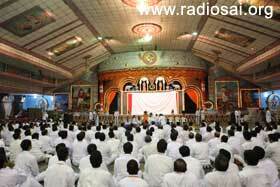 Swami then moved through the Bhajan Hall and blessed all those who had assembled. 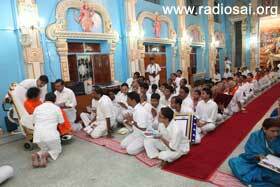 He exited from the back door of the hall and granted a bonus darshan round for all those seated in the portico. It was 7:50 p.m. when Swami retired for the day.